Zeina Zaatari is an Arab queer feminist from South Lebanon, who is part exiled, part migrant in California. She is currently an independent consultant and university lecturer focusing on gender and sexuality in the MENA. Zeina is also the Associate Editor for Europe and the Middle East and North Africa for the Encyclopedia of Women and Islamic Cultures. She is a trainer with two different programs focusing on research design, implementation, and analysis targeting junior faculty, graduate students, and professional researchers at national universities in Arab countries. 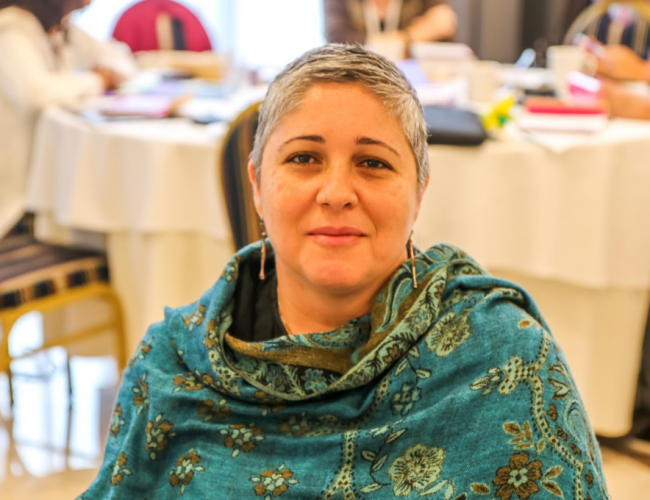 Zeina is the Secretary of the board of the Association for Women’s Rights in Development. Previously, she worked as the Regional Director for the MENA Program at Global Fund for Women (2004-2012) where she managed a diverse grantmaking program to support women’s and trans peoples’ rights. She earned her PhD in Cultural Anthropology with an emphasis in Feminist Theory from the University of California at Davis. Zeina’s current research project focuses on Interrogating Heteronormativity in Lebanon: Family, Citizenship, and Access to Adulthood. Her publications have focused on gender, sexuality (including queer sexuality), feminism, and movements.